B 17F 42-30772 crashed in the Baltic Sea 9/10 1943. The aircraft belonged to USAAF, 8 Air Force, 91 Bomb Group, 323 Bomb Squadron and was coded OR-V.
On the return flight from Anklam shortly after noon 42-30772 was hit by rockets fired from a two engine aircraft which set the left inboard engine on fire and made it necessary feather the right inboard propeller. It also wounded the ball turret gunner S/Sgt Harold Goldberger and the co pilot 2nd Lt Charles W. Hull severely. The bombardier 2nd Lt James A. Fullerton and the navigator 1st Lt Harry Cliffe bailed out and on the way down Cliffe saw that the left wing had broken off and that the fuselage had broken in half. They landed in the sea about one mile from each other and soon they were rescued by a German navy vessel which took them to Kiel. They spent the rest of the war as POW`s. The wreck crashed in the Baltic Sea south of the Danish island of Langeland. Bottom row (Left to right) Frank, Goldberger, Robinson, Baker, Jaskiewicz. 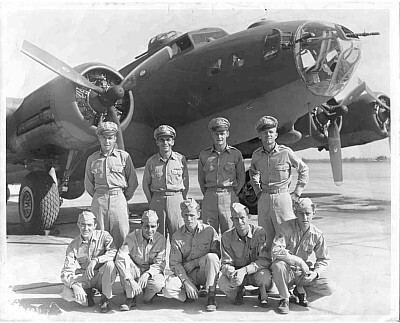 Pilot 1st Lt Thomas E. Walsh, 2nd Pilot Charles W. Hull, Top turret gunner T/Sgt Albert C. Jaskiewicz, Radio operator T/Sgt George J. Frank, Right waist gunner S/Sgt Robert R. Robinson, Left waist gunner S/Sgt T.D. Frazier have no known graves and are remembered on Tablets of the Missing at Cambridge American Cemetery, Cambridge, England. 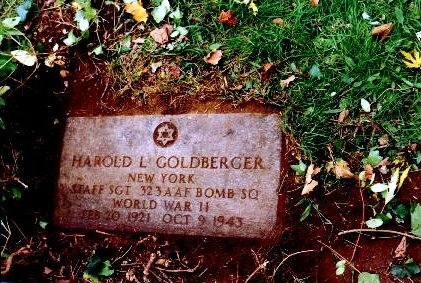 On 27/10 the body of Ball gunner S/Sgt Harold L. Goldberger was washed ashore on the beach on the south side of Flensburg Fjord near the Flensburg Lightship and was laid to rest in the civilian section of the Garrison Cemetery in Kiel on 30/10 1943. His remains were disinterred and were evacuated to the Ardennes cemetery in Belgium on 16/5 1946. On 13/5 1949 he was sent to the United States where he was laid to rest in the Riverside cemetery in Rochelle Park, New Jersey. The body of Tail gunner S/Sgt David L. Baker was on the evening of 4/2 1944 brought to Søby harbour on the island of Ærø onboard a fishing vessel and taken to the chapel of Søby cemetery. The body was examined on the next day and laid in a coffin. Since it was an allied flyer the Wehrmacht at Olde Mark was informed and in the afternoon the body was handed over to the Commandant and an Unteroffizier. At first the burial was planned for Sunday afternoon 6/2 but this was now changed for Monday morning 7/2 1944 at 07:00 hours. The graveside ceremony was performed without ecclesiastical assistance. Two German non commissioned officers and six privates were present and after having lowered the coffin in the grave they stood to attention for one minute saluting the coffin. After the war Bakers remains was disinterred and was evacuated to the American cemetery at Neuville en Condron in Belgium by the US military. Sources: ABMC, MACR, Harry Cliffe via Finn Buch, Report Ærø police, LBUK.